Split Rock Lighthouse near Two Harbors, MN was (and still is) equipped with a 3rd order, bi-valve type fresnel lens when it was originally built in 1909. That lens is still in place. This massive collection of glass prisms mounted in a brass framework is rotated with a clockworks and counterweight system. The source of light is placed right in the center of the lens. Originally the light source was an incandescent oil vapor lamp that burned kerosene. In 1940, it was electrified and the oil vapor lamp was replaced with a 1000 electric light bulb. The official range of this light was 22 miles. 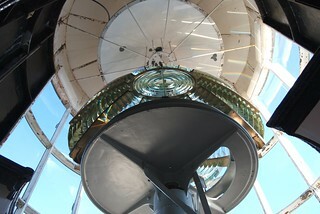 This photo was taken from the watchroom level of the tower, one level below the lantern. The watchroom level is where the clockworks is housed.